The problem of the prevention of diseases attributable to the human papilloma virus (virus du papillome humain) (HPV) extends beyond the field of infectious diseases traditionally prevented by vaccination. This is why the CIQ has followed a different procedure for the preparation of this report by working with a large group of experts, notably from gynaecologists involved with the fight against cancer and from sexually transmitted infectious diseases areas. The synthesis of facts was done by a writing committee made up of 4 people, following a model developed by Erickson and De Wals (Vaccine, 2005) which is currently the benchmark in this area. This synthesis encompasses all the information available up to August 15, 2007. 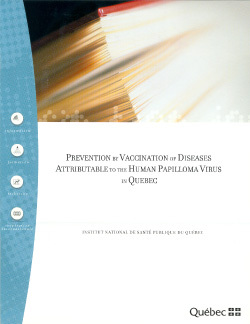 A broader meeting of the CIQ, with more than 20 experts participating from those areas affected by diseases attributable to HPV, occurred on May 31 and June 1, 2007 in Longueuil. The recommendations outlined in this report, were developed during this meeting. The CIQ then held a special meeting on June 15 to finalize these recommendations. The recommendations were then sent to the organizations interested in this issue, for consultation over the summer. During the meeting on September 27, 2007, the CIQ took account of the commentaries, carried out the appropriate modifications and adopted the final version of the report. The report is written in two parts: an executive summary which emphasises the main elements of the problem and states the recommendations of the CIQ, followed by a detailed synthesis of facts. Without overshadowing other diseases caused by the HPV, this report focuses on the prevention of cervical cancer. This is the priority reconfirmed during the meeting of the CIQ where the recommendations were worked out. This approach in no way diminishes the goal of also preventing the other diseases caused by the HPV. The possibility of preventing cervical cancer with vaccination is both an exceptional opportunity and a difficult challenge to undertake. Cervical cancer is a killer despite the considerable efforts invested in screening, and its virtual elimination would be a remarkable step forward. However, the scientific and organizational difficulties of this new program have no common ground with that of other immunization programs, mostly because of the need for co-operative efforts on the part of sectors that have never worked together before and that have very different traditions.